And you go WHAT?!!! Not fair for Motormouth to kick start HIS week with such a sumptuous feast and in Ipoh some more! Nah, but seriously … this is work. But just so happened that the cravings for Teochew food reached an all-time high last few days; culminating in an outburst of one utterly saliva-inducing shot posted on the Facebook page. And voila! MM was back in Ipoh within 2 hours and tucking in into some menacing Teochew dishes (with a pinch of Cantonese, or so claimed the proprietress) for dinner. Can’t claim all credits this time, for I have never heard of or stepped foot into this restaurant situated next to Kim Bali Restaurant on Osborne Street. The location sounds familiar to you? That’s because I was here the last trip back to have myself a piece of Hainanese chicken chop at Cathay at the other end of the row. And since Fay Loo Restaurant (meaning ‘Fatty’s Restaurant’; though there was nary a fat guy in the premise this evening … only an elderly couple; evidently the patriarch and the matron of the establishment!) opens only for dinner-late night, it’s no wonder many must have missed this gem of a place. Ordering from typical ‘dai chow’ restaurants like this ain’t a walk in the park for most. The signature dishes and all their creations are proudly written in Chinese characters on the whiteboard and various colourful pieces of paper stuck on the walls. If you’re one who reads the most basic of Chinese, then tough luck. Settle for fried rice and eat in silence while seated at one corner. Just kidding. What you need to do is open up your (motor)mouth and ASK for recommendations. Like we did. Though it’s best to steal a quick glance around and gain insights into what the crowd loves; for usually the fan favourites are pretty obvious. In the case for tonight, most patrons had FISH. 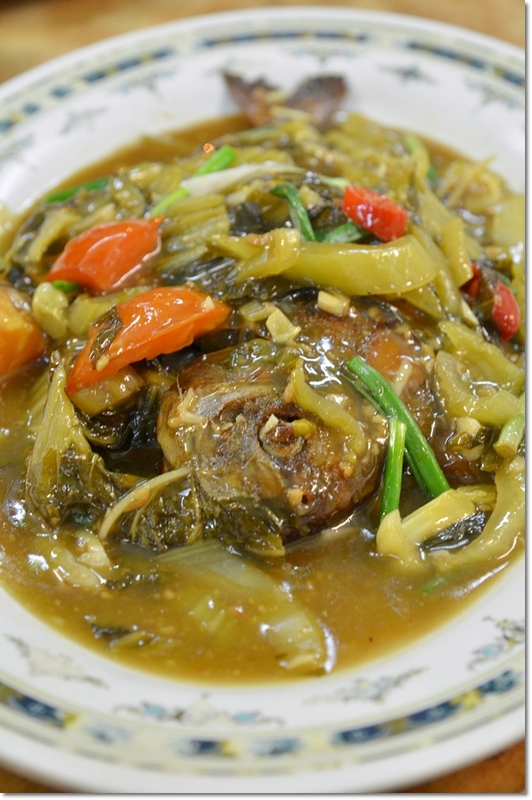 In a variety of ways; hence we opted for the safe choice of Black Pomfret (Hak Chong) first deep-fried until crispy on the outside, then braised in a sauce redolent with flavours from the addition of preserved mustard and tomatoes; a perfect complement to any bowl of porridge or rice. But the star of the evening belongs to the magnificent Deep Fried Pork Patty with Salted Fish. 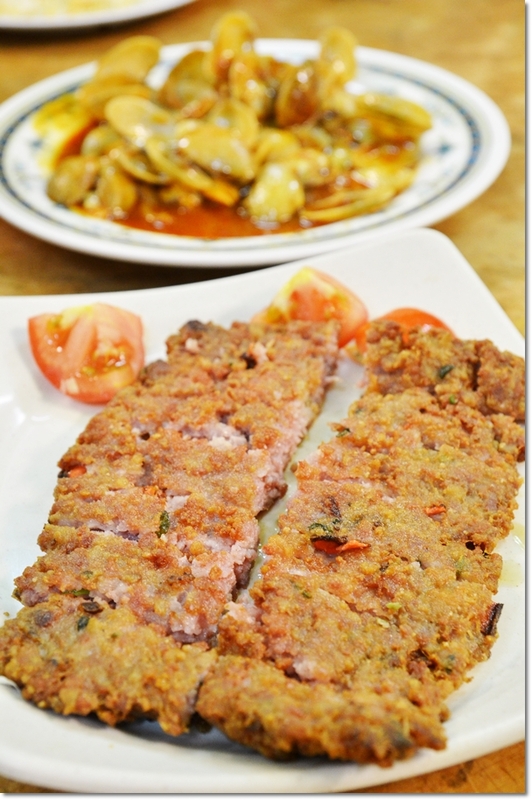 A timeless Teochew signature that was done to a tender and almost melt-in-mouth texture at Fay Loo, intermittent with briny nuances of salted fish that was pungent yet not repulsive. This was heads and shoulders above the competition (Ah Jik‘s and Sin Hup Heng included, and both of these are stalwarts of Teochew cuisine in Ipoh as well). 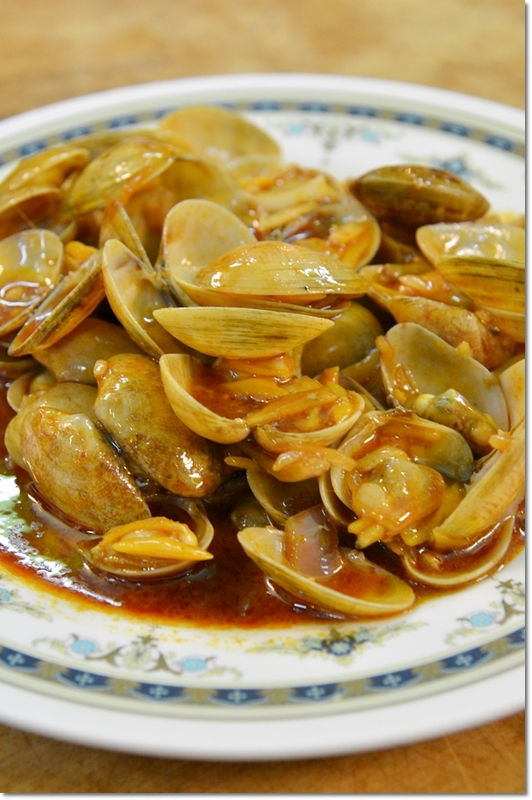 The Spicy Clams dish was a tad too fiery for some, yet went reasonably well with me. Last but not least, the Vietnamese Brinjals was a distant cousin of ‘Kam Heong’ I guess, yet some may find the drowned in a pool of oil appearance slightly baffling. Still, a very tasty dish with curry leaves, dried shrimps and onions to spice things up. You can choose to have your dishes with porridge instead of rice, and an additional serving of black beans dace or salted fish for a complete Teochew porridge experience. All in all, the meal costs RM56/USD18 for the 3 of us including Chinese tea. There are countless other mouthwatering dishes on the menu too; from yam with chicken to Tung Poh Yuk (Braised EXTRA-fatty pork belly), Teochew-style steamed fish to signature fried chicken. Verdict? Yes, we will definitely be back for round two. Question is … WHEN? Business hours : 6pm – 3am daily, until 4am on Saturdays. Refer to this Google Map to Cathay Restaurant, and find Fay Loo a few shops away. 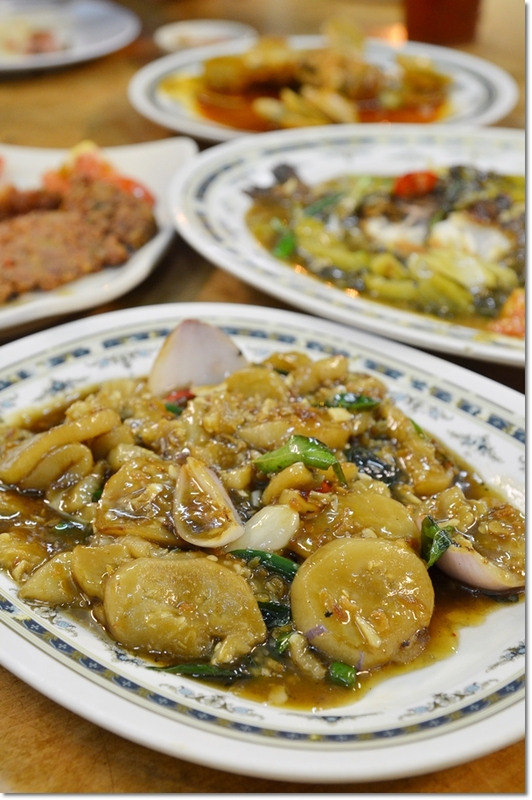 are all the dishes made to order or they cooked in bulk like other teochew porridge stalls? Cooked to order. Just like any other dai chow restaurants. MM, the lala looks tempting will check out that place this Friday. Frankly MM, maybe its a personal choice and old school, lately I noticed more review on those nice presentation and good outlook of the establishment than good food and value for money. I still preferred those old review of yours hunting for tai chow lobangs. Hi ckchoo …. you’re referring to the reviews done in KL? Or Ipoh? Problem with ‘tai chow’ in KL is that it’s a bit laborious for me to gather a group enough to hunt for those ‘hole-in-the-wall’ establishments that you used to see me writing about when around Ipoh. Don’t worry, ck, deep down inside … I’m still this (old) hungry soul eager to hunt down the most elusive, yummy and down-to-earth eateries. 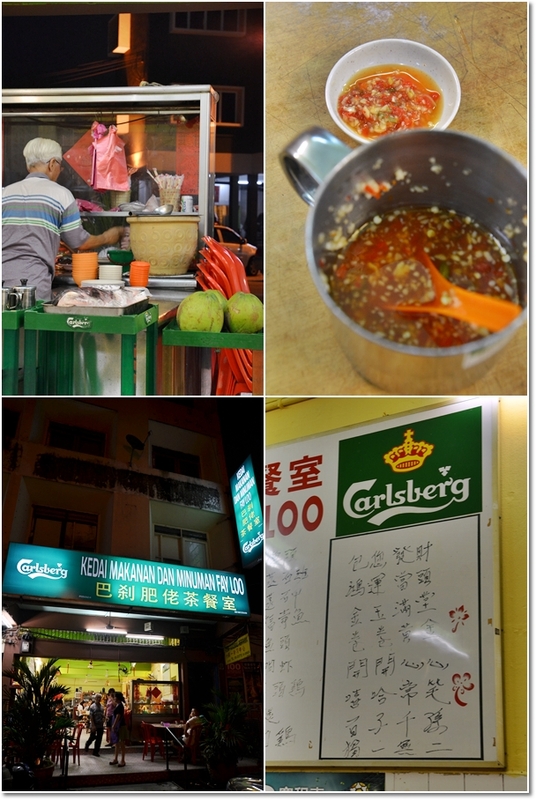 Next time when you are there, ask for “tok yat mo yi” (one and only). A sauce actually. You’ll love it. Unless they’ve change the management or cook.